This Saffron rice recipe yield 4 to 6 servings. It is important to note that you must use Basmati rice to make this dish which is similar to Nasi Briani and Nasi Tomato. 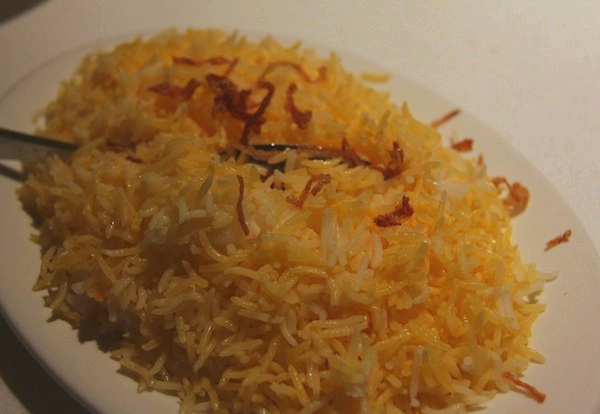 Saffron rice has distictive flavor of both Basmati as well as Saffron. Basmati rice is available in at most grocery stores in Singapore. Cover Basmati rice with cold water and set aside to soak for 30 minutes. Soak saffron threads in 3 tablespoons boiling water for 10 minutes. Melt butter in a pot over medium heat; add cardamom, cloves and cinnamon and fry 2 minutes, stirring occasionally. Stir in onion and saute, stirring occasionally, until golden brown. Stir in the rice, reduce heat to low and simmer for 5 minutes, stirring constantly. Cover pot and reduced heat to low. Let the rice cook and all liquid is absorbed, about 40 minutes. Fluff the rice with a fork before serving. Garnish with fried shallots. Serve rice hot with Ayam Merah, Briani dish or Steak. Thanks for the saffron rice recipe. If you don’t mind, can you submit your saffron rice photo in http://www.foodporn.net ? Thanks for sharing this recipe. Will def try this out when we have the time! i think this dish is similar to nasi briyani, nasi minyak, nasi jagung or nasi tomato. but what i like about this safron rice is its simplicity. though people might get confused thinking that this is nasi briyani without the briayani spices. I tripled this recipe for a dinner party and it came out great. It was the first thing to disappear from the platter and the first thing that I was complimented on by my guests. The texture of the rice did come out perfect. I served with Indonesian Chicken Satay and Rendang. The nice part was the taste of this rice did not over power my main dish. Just made this rice and it was excellent. I used half the amount of rice and broth, but the full amount of spices and it was perfect.